Players of the game were probably expecting a much different type of Curry Sea operation, given that Curry Sea is the name of one of the areas found in the game. Given the choice between the two though, I definitely prefer the route this episode took with curry. For those of you who don’t know (which is probably everyone reading this), curry is one of my favorite foods of all time. 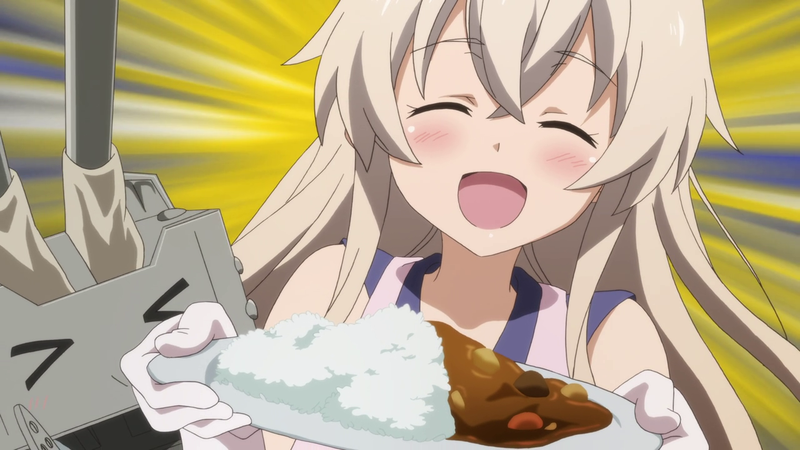 I’ve sort of stopped getting it all the time at restaurants though, since as Shimakaze demonstrates this episode, it’s very quick and easy to make yourself. Despite only appearing sporadically throughout the past 5 episodes, the 6th Torpedo Squadron prove that they can carry an entertaining episode by themselves with 4 distinct and complementing personalities. 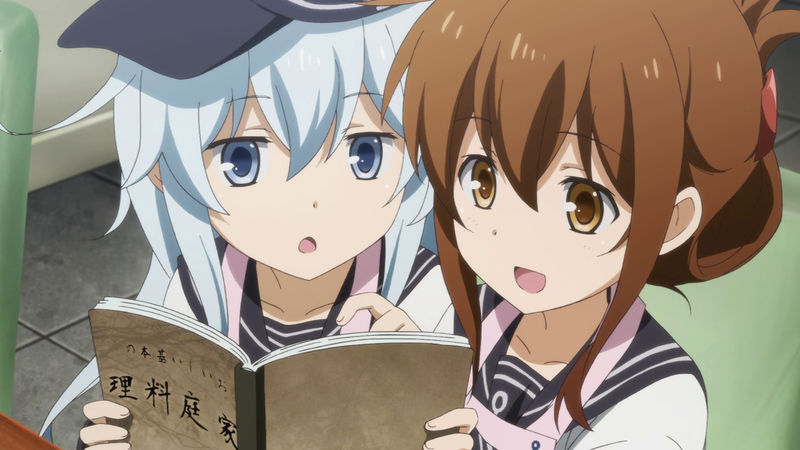 First, we have the two “leaders” with the lady-obsessed nameship Akatsuki and Ikazuchi, who I spent forever looking for when I first started playing the game. Then there’s the soft-spoken Inazuma who says “nano desu” whenever possible and Hibiki, the even softer-spoken ship from Russia and my personal favorite among the 4 girls. Inazuma is pretty close with her brilliant plan to torch their curry, but Hibiki wins out with her pot helmet. Tensions run high as the annual Naval District curry cooking competition draws near. Whoever wins gets to have their recipe used for an entire year, and everyone seems to have her own reason to win. Ashigara especially wants to win, in hopes of scoring nice relationship points out of it like some sort of Harvest Moon event. Kirishima describes Haguro as the girl everyone wants to marry and Ashigara as the girl that needs to get married, and that to me is comedic gold. It makes me wish that we could see some canonical romance in this series. I say that, but there is already an incredible amount of yuri vibes in KanColle, which I am totally down for as long as it’s cute and not overtly sexual (I’m looking at you Sakura Trick. Kitakami and Ooi are probably the closest thing to canon, but there’s also Fubuki’s crush on Akagi (though she has to fight Kaga for her first). 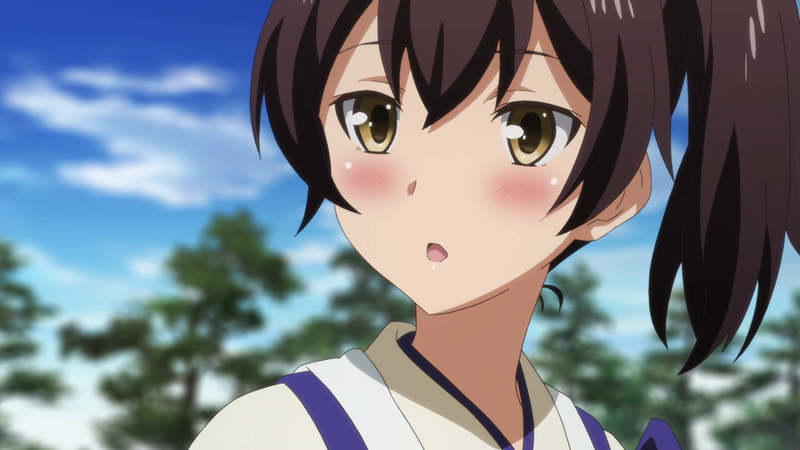 Even Kaga and Zuikaku are getting a lot of shipping action. But, I highly doubt that any canon will arise from KanColle. Though, I feel like this should be something they should implement in the game, somehow. 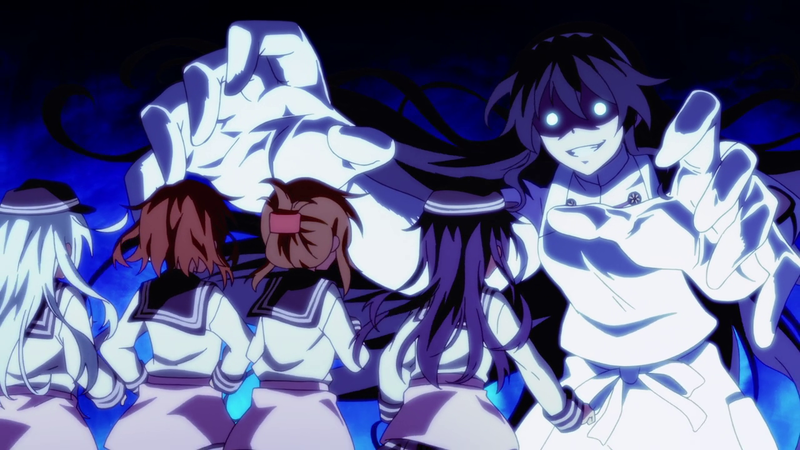 In short, half of the teams take themselves out of the competition, and things turn into a shounen anime episode for about 2 minutes, as the Destroyer girls gather the energy summoned by the power of friendship and hard work to take down the single final boss Ashigara. Good thing they won too, since apparently Nagato wouldn’t have been able to handle Ashigara’s spicy curry of self-loathing for an entire year. Next time, it seems there will be more Zuikaga moments for you ship shippers out there, so get excited!